Scars and stretch marks are really annoying, aren't they? I haven't met a woman who doesn't have these concerns. I'm using some products at the moment, although I've not been using them regularly, to be honest. This is not a review. I'm going to start using them religiously and let you know my verdict in a few months time. My skin concerns/type: Scar tissue on my belly button from a 2-time piercing I really regret, a few stretch marks on hips, uneven skin tone and occasional dryness. 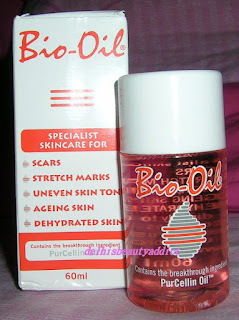 Bio Oil- It contains the breakthrough ingredient 'PurCellin oil', which they claim it improves the appearance of scars, stretch marks, uneven skin tone, aging and dry skin. The minute I read people raving about this on the net, I just couldn't wait to try it out. The little bottle is so cute too! 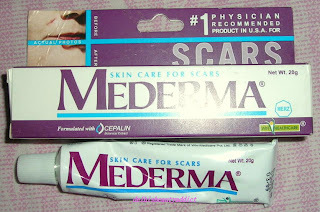 Mederma Gel- I first tried this between 2006-2007, probably the year it was first advertised in India. I didn't see any improvement of my scars and stretch marks then, even after I'd used up the tube. I bought another tube again 2 months ago, to give it another shot. It is a topical gel formulated with Cepalin, a botanical extract derived from onions. Meant for scars from injuries, surgery, acne; and also stretch marks. 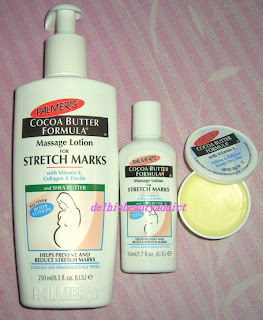 Palmer's Cocoa Butter Formula- This has been around for a while now but I've never tried it before. Formulated with a combination of cocoa butter, vitamin E, collagen, elastin and shea butter. It is specially meant for preventing and reducing stretch marks. I can only hope that they won't turn out to be a total waste of money and effort. **Only Palmer's Cocoa Butter and Mederma are available in India right now. @ Beautifier..aww..bio oil is what I'm counting on the most. I guess I'll have to b more patient then :). Let's see..